“To live without loving is not really to live”, Molière, Le Malade Imaginaire. Molière died of tuberculosis at the age of 51, while on stage in the middle of a live performance of, precisely, Le Malade Imaginaire. Yes, imaginaire. 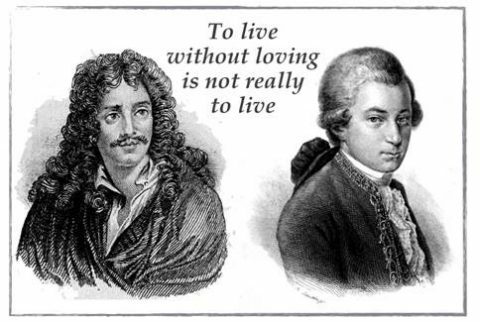 Imagine Molière could have doubled his longevity, that is, living 100 years. How many more genious-pieces would his intelligence and imagination have created? Mozart died at the age of 35. The recorded cause of his death was ‘severe miliary fever’; all symptoms indicate Mozart died of untreated kidney infection. Imagine Mozart could also have doubled his longevity, that is, living 70 years. How many more extraordinary tunes would his intelligence and imagination, sorry, would his love, have composed? And that is, if both Mozart and Molière had continued to excel on the same route. But how many unpredicted new discoveries would both artists have gratified us with, if they had embraced new routes, yet with the same passion? After all, Rossini, the great opera composer, lived long enough to invent the ‘Tournedos Rossini’ as a recipe and re-invent himself as a cook. Because, frankly, kidney inflammation and tuberculosis are long time eradicated diseases. If Rossini went from great composer to innovative cook; then imagine what Mozart would have been capable of as a Gaudi-like monumental architect. Or imagine Molière as an empathic doctor believing and practicing a non-medicine approach to medicine. Most of you will find this provocative. I find this actionable, I find this true. Well if, and only if, mankind would be immune. You build your immune system by strengthening your biology from within, not by relying on friendly outside help to counter unfriendly outside invaders. You build your immune system by pursuing a healthy lifestyle. That is sleeping well and enough, dedicating ample time to recreation, exercising regularly, and adopting high-standard eating habits. You build your immune system by nurturing a positive attitude. That is thinking positive, surrounding yourself with positive people, privileging positive news sources, and searching for positive references and models. The most important ingredient towards immunity in recent scientific discoveries is not a molecule, not an enzyme and certainly not a drug. The most important ingredient towards immunity is love. Love for what you do. Love for life. Love for people. Love builds health. Health builds immunity. Immunity builds longevity. And longevity would have given the world not ‘Eine’ but ‘Zwei oder Drei Kleine Nachtmusiken’ from an ageing Mozart, in his forties.